The launch of Penguin in July 1935 changed many things in British paperbacks. Most of their design innovations were copied from the continental publisher Albatross, but other publishers quickly copied them from Penguin and in just a few years they became the standard market practice. One of these changes was the use of colour to signify the genre of the book. For Penguin, orange meant fiction and crime was green. These two became the dominant colours in the Penguin series, although there was also blue for biography, cerise for travel, red for drama and so on. For Albatross though, green had meant travel, and they had used red for crime, both in the main series and in the Albatross Crime Club series, which had distinctive red and black covers. Was red a more appropriate colour for crime? On the other hand Collins had already issued Crime Club paperbacks in the UK, predominantly in green, so perhaps it was the more natural choice in the UK. When it became clear that Penguin’s experiment was a success, others rushed to follow, including of course Collins, who relaunched their Crime Club paperbacks in 1936 in a Penguin style format, with no cover art. 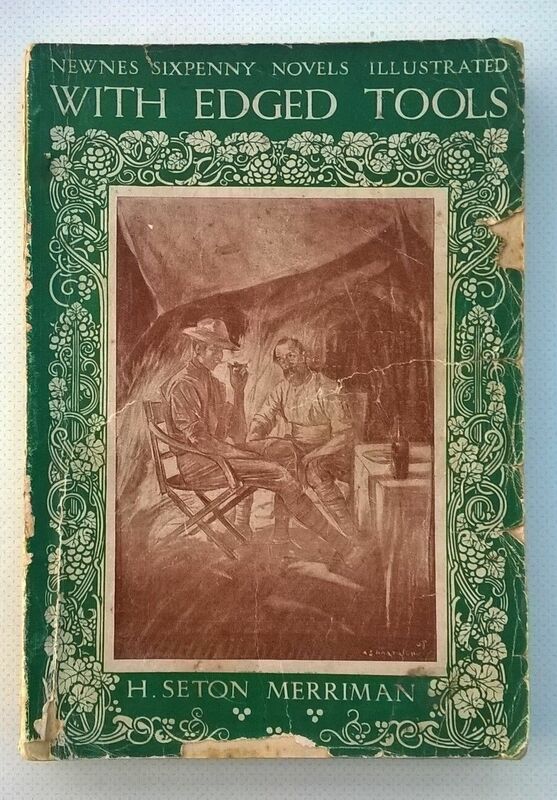 They naturally chose green, using a stylised illustration of two figures with knife and gun, later adding westerns in yellow and mysteries in purple. Hutchinson had launched its rival Penguin-style series in October 1935, using a variety of colours, but no clear indication of genre. In June 1936 it added an associated crime series under the ‘Crime Book Society’ brand, and again used a range of colours. But their distinctiveness didn’t last for long. Within a year or so they too had accepted that crime meant green. From about September 1937 onwards, all Crime Book Society paperbacks appeared in green covers. They were soon followed by two other imprints, both related to the Hutchinson Group, the Jackdaw Crime series and the Crime Novel Library. Both series used only green covers and the convention now seemed to be well established – green means crime. Tauchnitz Editions sold for around the equivalent of 1s 6d, certainly much cheaper than the typical 7s 6d price for a hardback in the UK in the 19th century, but they were not exactly cheap paperbacks. 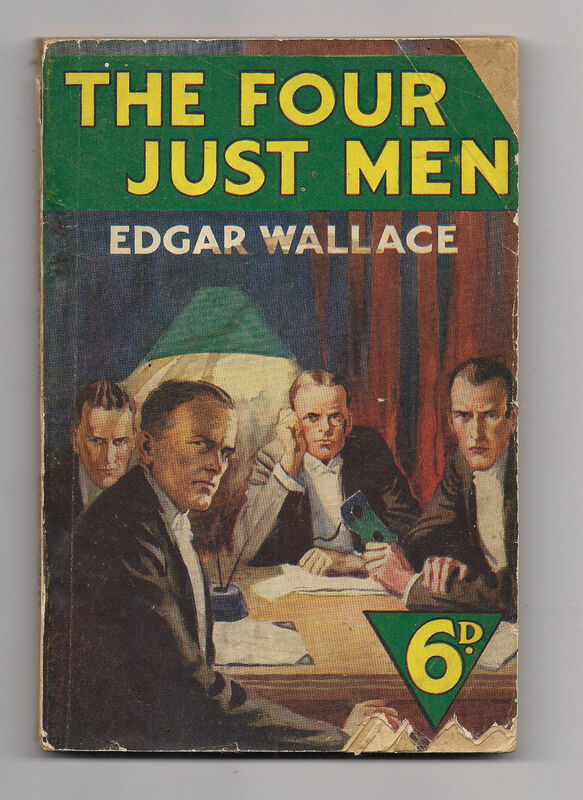 In the UK paperbacks rarely sold for more than 6d, even for much of the first half of the twentieth century, and were often more like 3d or 4d. Although the Tauchnitz Editions were mostly sold as paperbacks, the expectation was that many of them would be privately bound and so the quality of the paper, the printing and the binding had to be consistent with this. They had a delicate balance to strike between quality and price – not such high quality that they were too expensive to be bought as paperbacks, but sufficiently high to be privately bound and last for hundreds of years. But doesn’t every publisher dream of being able to escape from the constraints of price and produce higher quality editions? Tauchnitz certainly did, and the result was a very short series of gift books, known as the ‘Cabinet Edition of English Classics’, starting in 1862. Two of the volumes, ‘Childe Harold’s Pilgrimage’ by Byron, and ‘The lady of the lake’ by Walter Scott, were lengthy narrative poems that had already been published by Tauchnitz as part of larger volumes of poetry. The other two were Shakespeare plays, ‘Hamlet’ and ‘Romeo and Juliet’, available both as individual plays and as part of longer volumes. So all four were already sold by Tauchnitz, and at much cheaper prices. Here each is extracted to form a small gift-book on its own and is given a cloth binding with both gilt and blind-stamped decoration, an engraved frontispiece, higher quality paper and all edges gilded. Everything needed for them to appear like an attractive gift or keepsake. There is little information on the series in the Tauchnitz bibliography by Todd & Bowden, partly because the authors were able to find just a single copy of two of the books and no copy at all of the other two. This no doubt partly reflects the low numbers produced and the even lower numbers now surviving, but also probably that being unlike most other Tauchnitz editions, they are rarely found in the standard Tauchnitz collections. They are undoubtedly rare, but perhaps not as rare as the evidence of the bibliography would suggest. 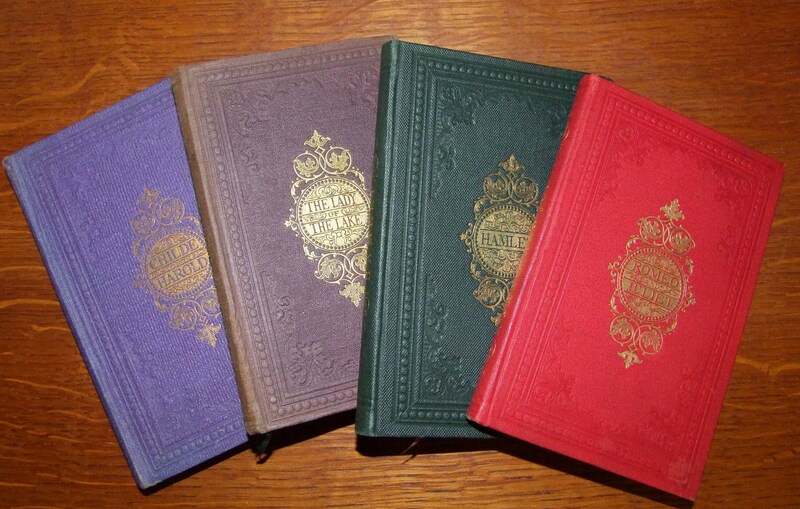 There are now copies of all four in my own collection, and I have seen evidence of several other copies. The evidence of the copies I have, contradicts the numbering and the dates assigned to them by Todd & Bowden. The books themselves are not numbered, but the bibliography gives ‘The lady of the lake’ precedence over ‘Hamlet’ on the incorrect assumption that they were published in 1862 and 1863 respectively. In practice the dates were the other way round, so that ‘Hamlet’ was one of the first two volumes, together with ‘Childe Harold’. 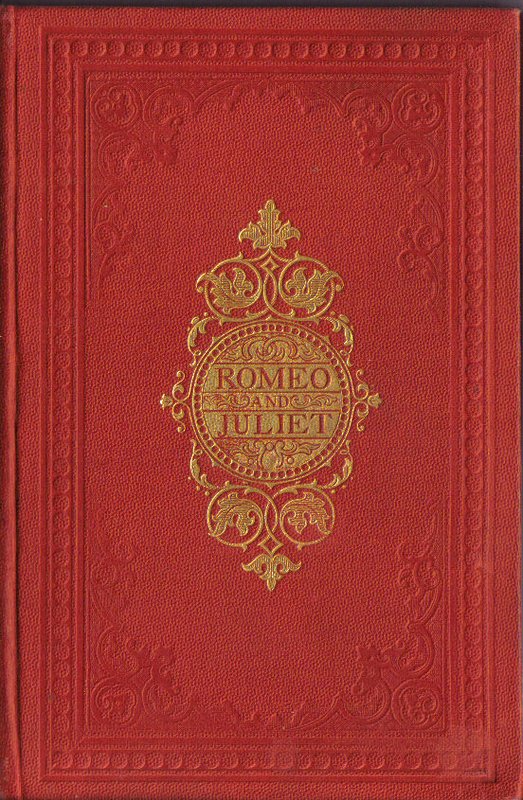 The final volume was ‘Romeo and Juliet’, published in 1864. Incidentally the photo above shows each in a different colour cover, but it may not be as simple as this. 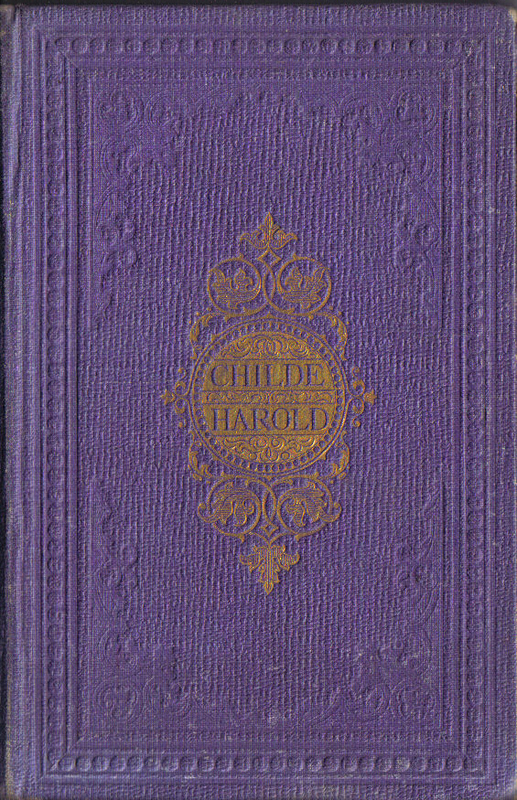 I have seen ‘Childe Harold’ in bindings of two different colours and with other differences as well, so it’s not clear exactly what else may exist. The price they were sold at, according to Todd & Bowden (referencing the 1880 German Book Catalogue) was 3 Marks (or 1 Thaler) for each of the poems, and 2 Marks (around 0.70 Thaler) for the Shakespeare plays. As far as I can tell, this price sounds reasonable for what they are, but the individual Shakespeare plays sold in paperback for 0.1 Thaler, so they may have looked expensive in comparison. Anyway as the series extended to only these four volumes, it seems safe to assume that they were not a success. At least one of the books though seems to have enjoyed a second life as a tourist souvenir in Rome. A range of Tauchnitz books with Italian themes or settings were produced by or for the Italian tourist trade in the 1870s and 1880s, bound in vellum and mostly extra-illustrated. ‘Childe Harold’s Pilgrimage’ was too small to be extra-illustrated with postcards, but it is now found in a variety of vellum bindings that seem to come from Italy. They’re likely to be quite a bit later than the original issue of the book. Did Tauchnitz have left over copies that they were happy to recycle in this way? Or did Italian bookbinders order new sets of printed pages for binding? I keep coming back to the launch of Penguin Books in July 1935. In publishing terms it was an absolutely seminal event, and this blog is after all called Paperback Revolution. But one of the reasons I keep coming back to it is that I still feel it’s an event that is often misunderstood. Some people seem to think paperbacks didn’t even exist before Penguin, although they had already existed for centuries. Others think they were the first to sell at 6d, although lots of paperbacks were sold at 6d before Penguin, and at cheaper prices too. There was even a series of hardback books at 7d, launched shortly before Penguin. Another claim is that Penguin’s key breakthrough was to publish contemporary literature in paperback, within a year or two of first publication. In practice though, their first ten books were published on average 12 years after first publication, and for the second ten this rose to 17 years. But one of the most persistent beliefs is that Penguin were the first to sell quality highbrow literature in paperback, whereas most previous paperbacks were downmarket and trashy. There’s enough truth in this one to encourage its adherents, but it needs to be examined critically. There can be no doubt about ‘A farewell to arms’. This is a genuine classic, the reputation of which was already established by 1935 and has only continued to grow since then. But what about the rest of them? ‘Ariel’, a biography of Shelley translated from the original French, was surely a serious highbrow book? Well, not really. It’s an example of a romance biography, which had been a relatively new style in the 1920s (the book was first published in France in 1923, and in Britain in 1924), combining fictionalised elements with a description of Shelley’s life. Described by one recent reviewer as ‘a featherlite meringue of a book … Shelley’s short life as a Hollywood melodrama … Skin-deep characterisation, shamelessly invented conversations and pulse-pounding dramaturgy put the whole experience closer to Downton Abbey than anything resembling scholarly rigour’. That doesn’t sound as if it’s a revolution from the paperbacks that were on offer before Penguin arrived. Number 3, ‘Poet’s Pub’ is a sub-P.G. Wodehouse comic novel, while Number 4, ‘Madame Claire’ is a light romantic story, at best middlebrow. Neither has laid any claim to literary posterity. Numbers 5 and 6 are both crime stories, relatively classic ones, but from a genre that was widely available in paperback long before Penguin. ‘Twenty-five’ by Beverley Nichols, is then an early ‘autobiography’ from someone now best known as a gardening writer. In reality though it’s more an account of the various celebrities he had met. In modern terms it’s almost celebrity journalism. Number 8, ‘William’ by E.H. Young, is another light romantic novel by an author who was bestselling in her day, but has been forgotten by history, as is Number 9. Mary Webb, author of ‘Gone to Earth’ wrote what have become known as ‘loam and lovechild’ stories of rural life, aping the style of Thomas Hardy. Webb’s style had already been parodied by Stella Gibbons in ‘Cold Comfort Farm’, which might have been a more radical choice for Penguin’s ‘first ten’. It did appear later. That leaves ‘Carnival’ by Compton Mackenzie, the oldest book in the first batch, having been first published in 1912. It’s the story of a dancer, her life and loves, which had been very popular in its day and twice made into a film. Maybe a slightly more serious choice, but certainly not a revolution in terms of the type of book available in paperback. As an aside, two of those ‘first ten’ authors, Compton Mackenzie and Eric Linklater, were active in the Scottish National Party, formed only a few years earlier, even though Mackenzie was born in England and Linklater in Wales. Perhaps their political legacy is greater than their literary legacy? Overall it seems to me hard to sustain an argument that Penguin’s early success was due to publishing more highbrow literature than had previously been available in paperback. The story is more complicated than that. Penguin undoubtedly did go on to publish serious literature and established something of a highbrow reputation through ventures such as Pelican and the Penguin Classics. But I’d argue their early success was more to do with getting rid of illustrated covers, than with the actual quality of the literature. Penguin’s real trick was to make you feel you were reading serious literature, rather than another trashy paperback. But what it actually served up within those iconic covers, was often very similar to what had gone before.